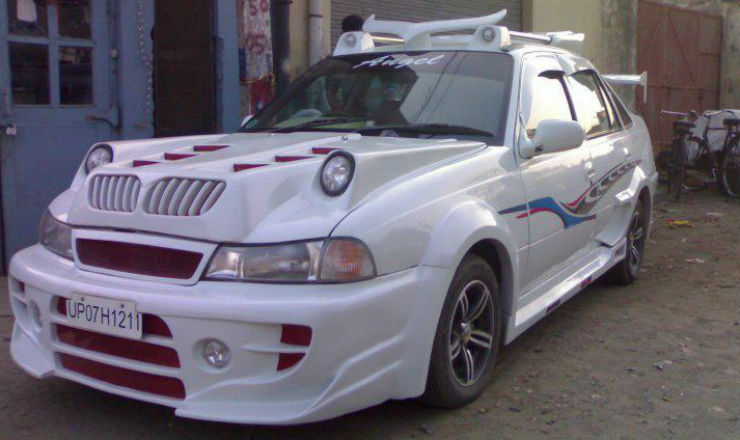 Here are some more disastrous body kits, which have transformed perfectly good looking cars to weird sets of wheels. The Honda Civic is a timeless car that even after a decade of being in existence, continues to look really appealing. If you start off with such a good looking car, it is certainly tough to improve on it, as you can see from this mod. The Civic which is more of a sleek and cool looking vehicle has been transformed into something that has a lot of chrome and something that doesn’t look all that nice. The bumper with the excess lighting doesn’t really suit the look of the car and nor does the massive bonnet scoop. The rear has a spoiler and a redesigned bumper with quad exhausts and air vents on the side. The Accord was built as an elegant luxury saloon with emphasis on the back seat. 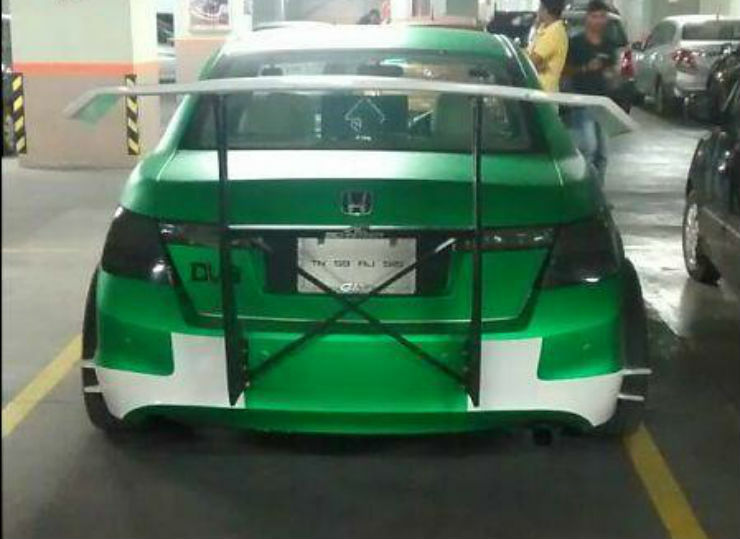 There are a few enthusiasts out there who have modded the Accord and there are a lot of good ones out in there. This one sadly looks a little over done. 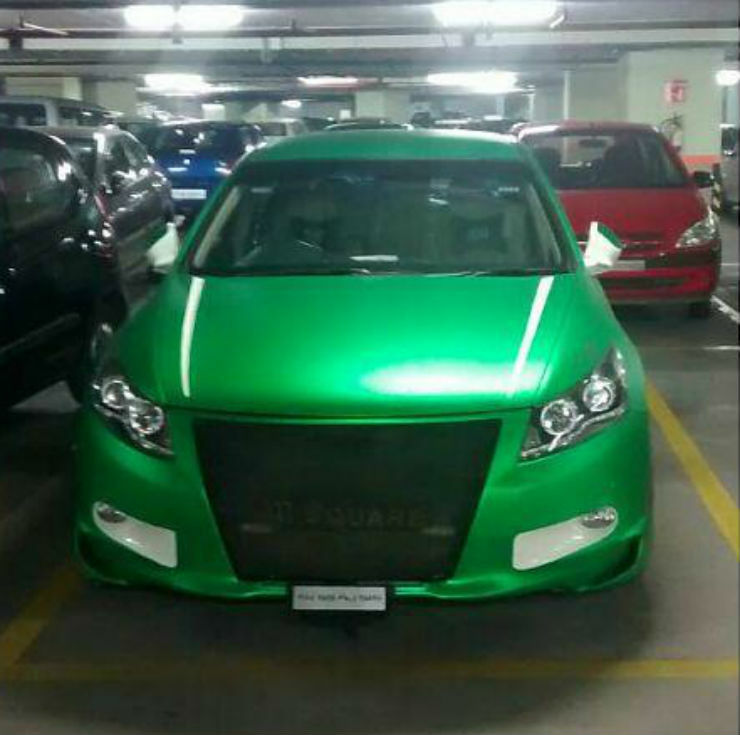 While the loud green colour isn’t to our taste, the thing that spoils the look the most is the massive front grill which looks like it has been taken from an Audi. There is also a massive rear spoiler which looks out of place in a luxury saloon. 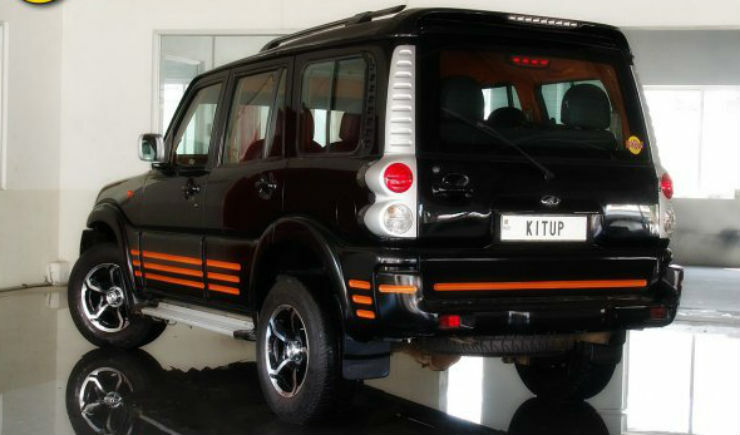 The Scorpio is the choice of those looking for a rugged vehicle which has status and a little comfort as well. 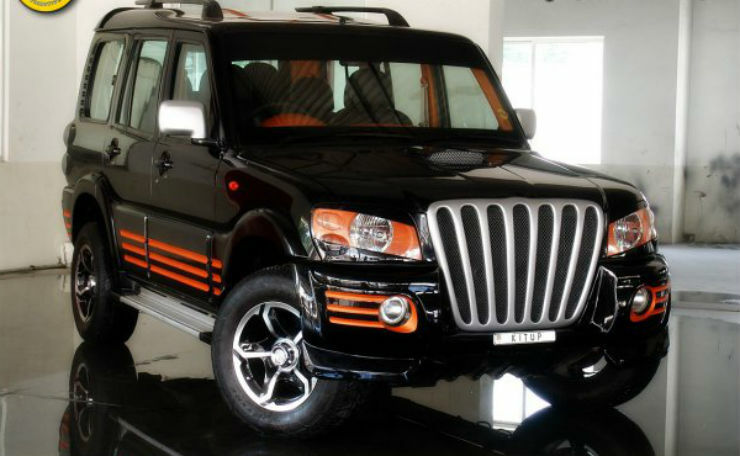 Being a Mahindra, it is conservatively designed and has nothing too outlandish about it. This one though has been redone to stand out. And it does, for the wrong reasons sadly. The massive Audi like grill up front finished in chrome and the orange finish on the headlamps and all around the car look sad. The tail lamp cluster which is otherwise glass has been finished in chrome like finish which also doesn’t look really good. The Cielo was an elegant looking vehicle when it was introduced. For that time, it was actually pretty good looking as well. This one though has gone way too over the top. There is a new bumper that doesn’t look really good. 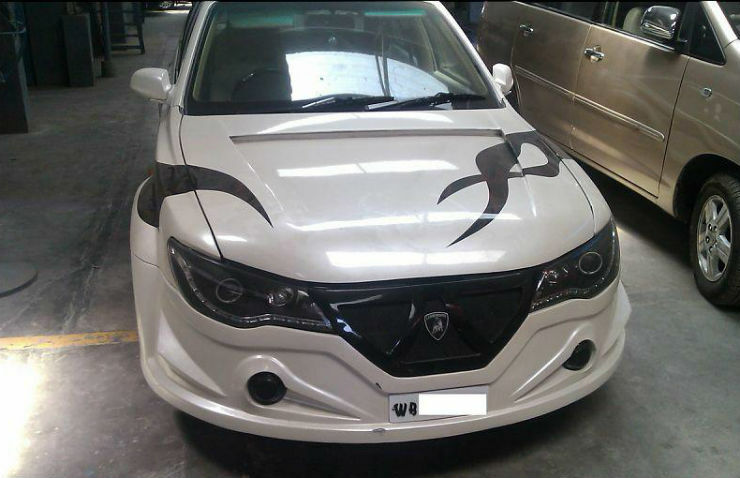 The thing that is actually the worst part about this design is the bonnet which now houses the Kidney style BMW grill which makes it a dual grilled vehicle. In addition to that, there is a lot of muscle in the bonnet and 2 additional lights as well. Looks like the owner likes to be really loud and the fact that he has a massive spoiler, roof rails and an eagle shaped emblem on the roof just justifies that fact. The Accent Viva was quite a popular car when it was introduced. This owner though took it to an all new level. 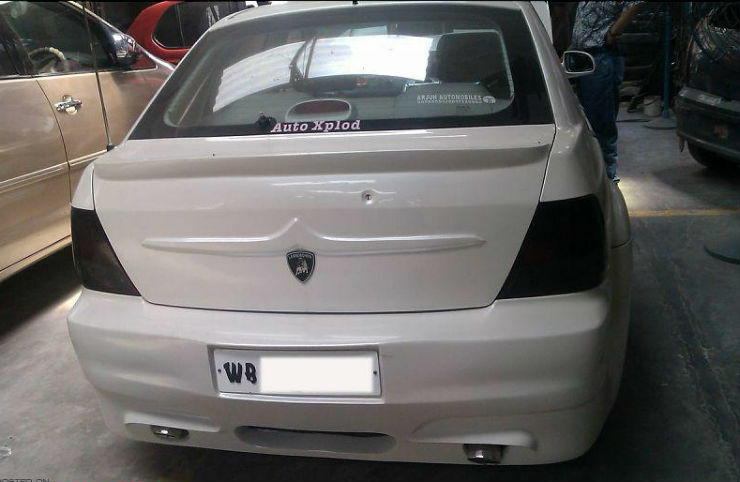 Being a Lamborghini fan, he has put on Lambo badges onto the the grill which has been replaced. There are also new headlamps that have been taken from the Civic. The bonnet, bumper and the whole rear end have also been redesigned and doesn’t really look very appealing.